There is a natural connection between beekeepers and their environment. Three things are needed for honey production: a strong colony, source of local water, and nectar bearing flowers. If one of these things is missing there will be little (or no) honey and wax production. In the past 20 years environmental change through slash and burn farming has drastically changed the continent of Africa. If asked, the biggest struggle most African farmers claim they face is, “a shortage of income”. If we can help farmers see that preserving the environment is lucrative there may be hope for the future. We must remember that most small-scale African farmers are diversifiers who are working with small amounts of capital. They are using perhaps 6-7 different practices to make a living every year. Once farmers realize that a portion of their income is derived from the nectar of the flowers in the surrounding forest they may well be persuaded to change they way they farm; adopting more ecologically friendly methods. Helping farmers keep bees and educating them in beekeeping, as well as forming beekeeping lobbies will positively impact the environment at large. 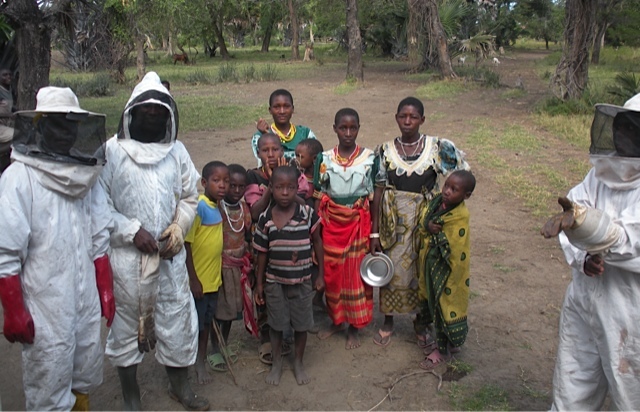 Some beekeepers from our May-June 2015 training with protective clothing they purchased from us. In the 10 years we have been working with beekeepers in Africa, we have seen time and time again that the beekeeper can pay his investments off after one harvest. We advocate the use of top bar hives initially until the new beekeeper can become accustomed to working with bees and until he or she may save up enough capital to invest in the more costly system of Langstroth beekeeping. In our estimation the best way to start a farmer in beekeeping is by helping them start slowly with a lower tech, less expensive hive. 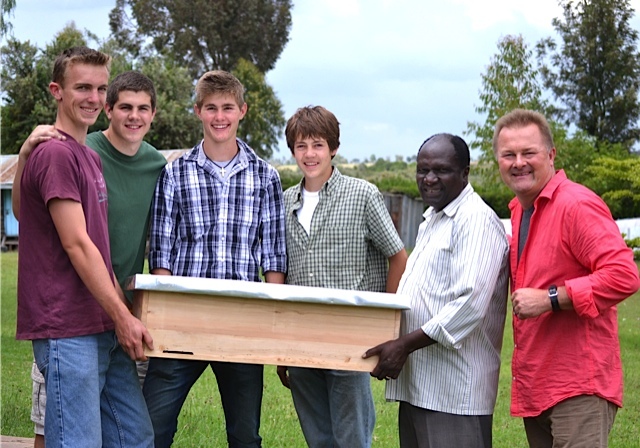 That means if a farmer is interested in beekeeping we encourage them to purchase one or two 20-25 bar, top bar hives. They can be built for between 25-30 US dollars each. After these hives have become occupied with swarms and the hives mature they will see the benefits of beekeeping, as the honey collected will pay off both of the hives in the first year. A beekeeper can expect approximately 10-16 liters of honey from a well occupied 25 bar hive, if there are two nectar flows per year. The contribution that honeybees provide in pollination of crops is infinitely more important than the contribution that they make in providing honey and wax. It’s estimated that there are about 2.4 million colonies in the U.S. today, two-thirds of which travel the country each year pollinating crops while also producing honey and beeswax. The contribution made by managed honeybees hired by U.S. crop growers to pollinate crops amounted to just over $14.6 billion. African as well as European honeybees practice flower fidelity (flower faithfulness). In other words groups of forager bees target specific flowering plants until they stop giving off pollen and nectar. This is good for the farmer who wants all of his citrus flowers pollinated. Honeybees situated near his garden will do the job well pollinating all of his flowers and not getting distracted by other types of flowers blooming less abundantly. African honeybees are better pollinators than European honeybees because they emphasize brood rearing and colony growth instead of honey production. The more brood reared the greater demands the honeybee colony has for pollen as opposed to honey. Pollen is the protein fed to the larva by the nurse bees, causing the larva to grow. Ripening nectar or honey is the carbohydrate providing the fuel for the colony. As human children need more protein in their diets than adults do to stimulate proper growth so do developing bees. Therefore colonies that rear more brood need more pollen. The point being that African bees (Mellifera Scutellata) make great pollinators! With bees ready to pollinate the farmer’s crops a healthy view of beekeeping will give us a healthy future for agriculture and the environment. The future of Africa’s fragile ecosystem and current farming practices go hand in hand. Once rural farmers realize that beekeeping can increase their yearly income, they will be more concerned about caring for the forest around their farms. Those nectar bearing trees contribute a large part to the small scale farmer’s honey and wax production. We believe in encouraging enthusiasm in African beekeeping. In this time bees in many other parts of the world are struggling, but by God's grace the African bee remains strong. Strong colonies of bees gather nectar and pollen from forest trees. Good ecology is foundational to good beekeeping. Beekeeping lobbies formed in local villages will be the first line of defense against charcoaling and slash-and-burn farming, which hurt their livelihood. 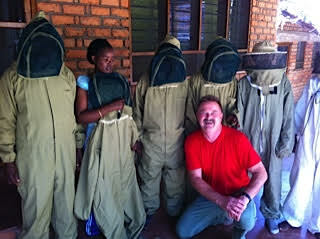 Team of Tanzanian beekeepers-in-training. 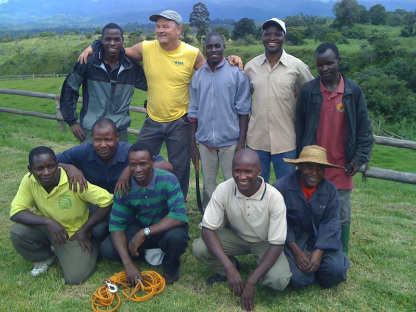 These men and others like them are the future of beekeeping in East Africa!